Have a Pub Crawl coming up? Need some T-shirts for your crawlers? Or have an idea but need a cool design? We have helped several people make their pub crawls more enticing, and build exposure, and help identify the drinkers on the crawl! Check out some of the samples below! Sadie’s Safe Harbor Canine Rescue came to us with a need for Pub Crawl shirts they wanted to give with their registration, and we suggested that we could handle the registration on their behalf! 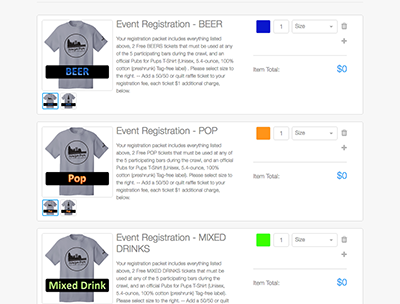 We created a mini – Registration website to assist, and collected the pre-reg’s via paypal and were able to easily track what size shirts people ordred, who ordered. They even included Raffle tickets, and made them consent to a bit of legal speak before purchase. Interested in Learning More? Contact Us to discuss your options!